An all-day fishing trip for Dolphin this time of year in Fort Lauderdale can be very rewarding. Dolphin, or Mahi-Mahi as we call them to eliminate confusion between the fish and the mammal, can be caught just out of the blue but are usually found around weed lines or floating debris. Almost anything floating can hold fish… Pieces of wood or rope, netting, barrels and buckets… The key to success is finding that debris. Our fishing trip today was Tammy, who has fished with us before, her two sons Brandon and Justin, and Curt, a nephew or cousin, I can’t really remember. LOL The request for Dolphin was what they wanted and we set a plan for the day to spend most the day off shore looking but first? Let’s catch a few fish close in. We didn’t have to wait long either for our first few fish. Just outside the sea buoy at Port Everglades, a deep line went off, then 3 other hits all at the same time. We boated a nice sized Kingfish and 3 Bonitos. The boys got to handle the rods and some quick instructions on level winding the line in would be advantageous later. Getting covered up like this is a great start to our day. A few more passes did nothing to improve our fishbox so we left the area and headed off shore in search of our prize. Dolphin fishing trips can be a hero or zero type thing and as mile after mile from shore went by, we were beginning to get concerned. We’ve had lots of rain and the water was brown in color to about 600’ or 3 miles from shore. It then changed to a sort of blue but not clean blue like Mahi’s like. We then found the really pretty blue water out about 6 miles but nothing to fish to except scattered weeds here and there so we pressed on until we were out about 11 miles from shore. We had found a streak of weed and fished this for some time with nothing happening. It was now about 11, our trip getting close to half over and we still hadn’t boated a single fish, or even had a strike for that matter. The mate, Justin, and I were both wondering if today would be a bust. Absolutely nothing was being heard on the radio. But outside us another half mile or so was yet another something, we couldn’t tell. Let’s check that out. A nice line with huge beds of weeds was certainly the formula for what we were looking for. As we got close and made our turn to fish along the edge, our first hits from Dolphin came from under the weeds. And this began what ended up being over 2 hours of pure catching. Each pass brought more Dolphin, 2, 3 or 4 at a time. The area of weed ran for about a mile or so and with the current of the Gulf Stream, we drifted north about 6 miles. At times, we had to regroup as nothing to fish with was left in the water, they had eaten everything we had out. As time went on, we ended up throwing back some of the smaller fish and keeping those that we knew were of legal size. No really big ones though we saw a few nice ones jumping, the biggest being about 10 or 11 lbs. Our cooler was packed full and we left them biting and headed home. Back at the dock I snapped this picture. All in all, we had caught over 30 Dolphin, I stopped counting at 30 because everyone was picking up fish and taking pictures. Can you blame them? This had truly been Mahi madness, one of the best days for catching Dolphin we have had in a long time. And I have to thank Tammy and the boys for doing so well and making us look good when we came back in. This off shore Dolphin fishing trip ended up being one of the great ones. I know I and they will remember it for a long time to come. This time of year in Fort Lauderdale our guests often request to fish Dolphin for the targeted species. Our group today was no different with 20 lbs. of chicken back at the house to barbecue, some fresh fish would be a nice addition. Greg, Andy and Jeff were all ready to go on the 4 hour morning trip and with our early start, we were first out. The sea buoy that marks the entrance to Port Everglades is an excellent place to start trolling too. The chain and the buoy it holds has all sorts of growth on it, as well as offering a place for small bait fish to hide. A lap or two around this marker can bring excellent results. But our first two hits were misses… One cut the high line, another on a deep line. Both baits cut as if with a knife, probably Kingfish. As we wandered away from the buoy another strike on the deep line did not connect. It was reset immediately and another strike came and missed. This is the pattern of a Sailfish and when the line was reset and tripped again, Justin let it come up some from depth before resetting it. And he did it just enough for the Sail to find and eat my high line. Fish on! Andy was in the chair and even though this wasn’t the target today, it was exciting as can be. The group helped Justin get the other lines in and Andy did a great job fighting the fish. He had us stretched out pretty good for a while, me on the radio asking other boats to keep clear and soon our prize was boatside for pictures by the crowd. I’m afraid I never had a camera shot at this one, he released himself before we could remove the hook for him. We were letting him go anyway. Now when anyone who knows sees a charter boat backing up, they know something cool is going on and a very short time later we were , once again, clearing lines to back up! We’d had a good hit on one of the deep lines and this fish was taking us to town. We were down to the backing in no time before we got the lines clear and the boat into reverse. Now gaining back some serious line, this fish again took off. A call came in on the radio asking what we had on now??? No clue I’m afraid. But this time our prize wasn’t a fish but a mammal eating what we’d caught. A large Porpoise had found our Bonito and was having a game of tug of war with us. He was enjoying it, our angler was not. This happens often when Porpoise are around. They have the ability to steal our fish without so much as a bat of their eyes. They don’t eat the entire fish and their telltale mark is left on the head, a sharply cut V in the top. A small King was caught without incident, a Blackfin Tuna and another bomber Bonito. We came across an east west tidal line and caught a decent Dolphin. Lately, the Mahi’s that have been in shallow waters have been attracted to the boat sitting rather than trolling so we put out a few shark baits in the area and hoped for the best. The Dolphin activity was too far from shore to get to on a 4 hour trip. 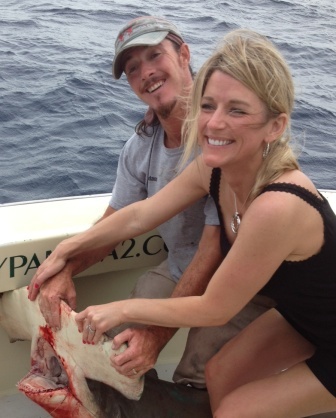 The Mahi we’d caught would turn out to be our only one but we did manage to hook a Hammerhead Shark. Andy again was in the chair and is pictured with this 7’ T head. The hooks were removed and he was set free and our trip was over. Happy 4th of July guys… Hope the fish added to the barbecue. It started like any other fishing trip we run here in Fort Lauderdale. Good morning, get their names and where they are from. Mark and Amy, like so many couples, just out for a good time and Amy says she wants to catch something big. So out we go to see what we can catch, just the two of them on board with Adam and me. We begin trolling and right away hook a couple of Bonitos by the sea buoy. Both people fighting their respective fish, Mark on the long deep line, Amy on the short. It’s always good to catch a few right away in the trip, give our guests something to bend the rod with. While most our best shark fishing is late winter and spring, there had been a few around and we rigged some baits and deployed them. We fish a surface, mid bait and bottom bait when putting out a full spread, deployed in that order. Adam was sending the mid bait down and was maybe 60’ from the boat when he yelled “GO”. Something had eaten the mid bait on the way down to depth. Amy parked in the fighting chair, rod strapped in with the safety lines, the battle began with Mark videoing the entire affair. International 130’s are the biggest rods we used and this fish was owning us. Amy said she just couldn’t do this but Adam coached her through the tough spot and then put the reel in low gear which helped her fight her fish. It took 20 minutes to get the fish to the boat, remember it ate the bait just 60’ away from us. Adam got the leader in his hand but this fish was not ready and still had plenty of power. We estimated the fish at 7.5 to 8’ long. And then, Amy’s hammerhead shark decided this boat thing was not for him… And left. Amy was kind of disappointed as the fish swam out more line than he had taken before and the battle began all over again. But Amy had new wind in her sails and now was determined to land this fish again, even though she had caught it once. The fish was finally caught again, the hook removed, he was measured, photographed and released. Hammerhead sharks are protected in Florida waters. We can only estimate the weight of this fish around 300 lbs. or so but his length? 109” exactly. For a male, that is huge. Our trip was over, Amy and Mark were done and after all my years of doing this, I still enjoy hearing my customers say how cool that was. Great part is? I get to do it every day. While not always this way, the Mahi-Mahi fishing has taken off in Fort Lauderdale’s off shore area. The last week has been exceptional for these highly sought after fish. Light winds and calm seas have had Sargassum weed everywhere and with this sea weed comes the food Dolphin love to eat. Small brine shrimp, Sargassum fish and other small inhabitants attract small bait fish and the Mahi-Mahi, Dolphin, El Dorado, whatever you wish to call them are flocking to these weed beds migrating south. This is the time of year we mostly troll for fish and Mahi’s are one of our favorite to catch. Even the small ones put up a great fight, especially if we can drop down the size of our tackle. Many “peanuts”, the ones not big enough to keep, are released but keepers are with them and some large ones as well. Most of this action has been out in 750’ of water, about 4 to 5 miles from the shoreline. Closer to shore, the Bonitos and Kingfish have been biting well. People enjoy the Bonitos because they fight hard but after a bit in the Florida sun and heat? They are happy to take a break and go look for the mahi-Mahi that have been off shore. While this has been plenty of action for us, we’ve also had a number of sharks being caught. There was a lull a few weeks ago and sharks became rare to find but that hasn’t been the case as of late. 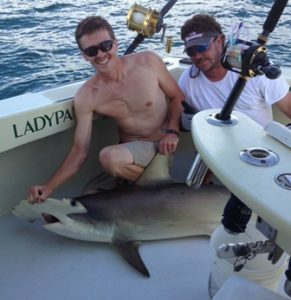 Some Hammerheads, Sandbar, Bull and even a Dusky have been caught recently. So if a big fish is your wish, it’s happening right now! Fort Lauderdale fishing has been exceptional this week. Get them while they’re here!!! 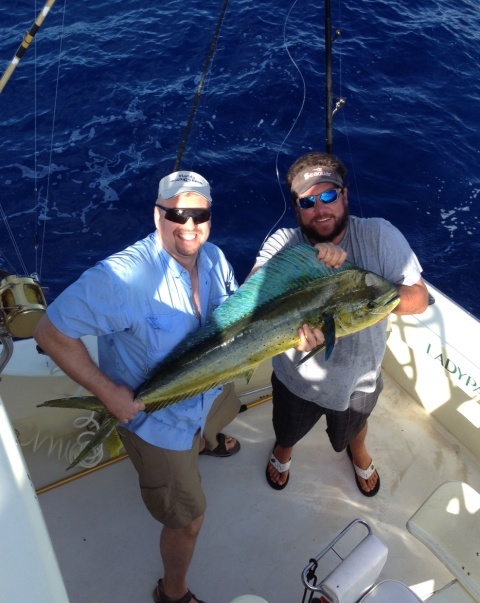 Fishing for Dolphin (Mahi-mahi) around Fort Lauderdale has improved tremendously this week. It has been an absolute blast going off shore a ways and finding large beds of seaweed. While the seaweed is tough to deal with as far as keeping the baits clear, it’s worth it when you see Dolphin racing out from under those beds and heading for your rigged baits. Our best action has been 5 to 8 miles from shore, a bit further out than we normally fish. Many of the fish are small from micro sized to around 5 or 6 pounds, so tossing some back has been the norm. But enough keepers have been with them and when the little ones are around? So are some of the bigger ones like in the picture attached to this report. With our weather lending to calm seas and sunny skies, it’s one of my favorite types of fishing. We troll for these fish to locate them. When found, they attack our baits and begin jumping immediately when hooked! As you reel the first few to the boat, followers may appear. A spinner with some cut bait or a livie can net you some more. It is total mayhem and chaos with lines coming down, rods being handed off and you’re on your own as the mate races off to grab another rod. Dolphin are one of the most beautiful fish we catch. Their colors are magnificent and they make excellent table fare. The Hawaiian name Mahi-mahi means “very strong” and is well deserved. The small ones are fun but the big ones take patience and some touch to get to the boat. They can be a real battle and with all their jumping and pulling, some do escape to be caught another day. If you’re joining us this week for fishing, you can expect to spend some time fishing for these fish. And I think this will become one of your favorite fish to seek and catch as well. Each fishing trip we run has an element of surprise in it as we begin our day. We never know what we will encounter as we put our baits out in the water. Just as our guests, we have hopes of great fishing but what kind of fish and how big will they be? As the warmer weather comes to south Florida we almost always begin by trolling some rigged baits. 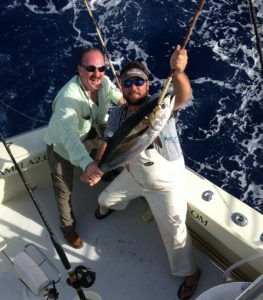 Kingfish, Bonito and more are usually available with this kind of fishing. That’s what we expect. And today’s group got just that, a quick bite from a small Kingfish. Russell easily handled this fish to the boat as we began to search for more. But more were not to be found. A school of one? We began working our way north with plans of making some deep drops on the artificial wrecks and reefs. William was on the bridge as we trolled saying how nice it would be if we caught a Wahoo. Wahoo, no matter what size, are always welcome and I agreed but mentioned there hadn’t been many around. Apparently all you have to do is ask and your wish is granted. Our next bite turned out to be a nice sized Wahoo! And there is always a sigh of relief once the fish is boated. Their speed and sharp teeth can play havoc beside the boat. So, what would you like to catch now William??? As you can tell, trolling wasn’t doing us much as far as action so we went to a wreck in 265’ of water to try a live bait on the bottom. Grouper, Cobia and Amberjack frequent these wrecks and since we had an early start, we were there first. What usually takes but a moment took 15 minutes to finally get a bite. The fun for this fish was the guys making fun of William as he struggled with the 80# class rod doubled over with a nice sized Amberjack on it. The fish was boated, photographed and released. Another drop produced nothing, not even the bait got nervous, and we were off to fly the kites for something bigger. The winds were light and with those conditions, the live bait sometimes can pull the kite around allowing him to get out of position. We also had to keep bumping the boat into the wind to keep the kites in the air as the wind was iffy to say the least. 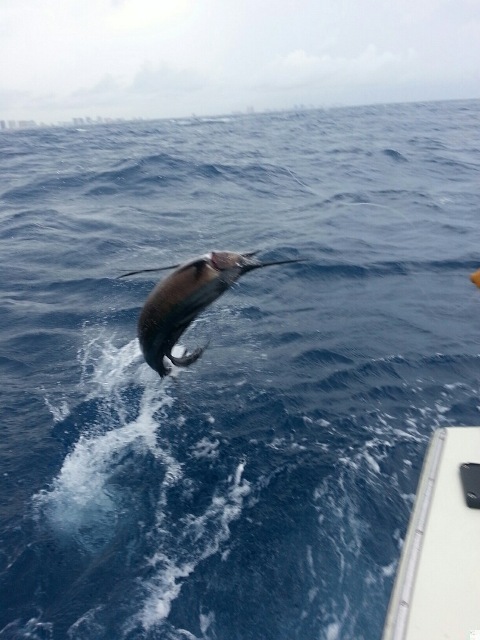 One of the baits had stretched out quite a ways from under the kite when a Sailfish appeared. The fish lunged at the bait but with the kite barely hanging, the bait escaped and the fish lost interest. Major disappointment on our parts as we waited for our next bite which came shortly after. From quite a distance, something was coming toward the kite at tremendous speed. The head wake was easily seen by all and there was NO chance of the bait escaping this time! A large Mahi-mahi had struck. He was easily seen as he gulped the bait and then headed for the short bait on the same side. Having a fish on 2 baits and rods is not optimum so we tried this fish and luckily hooked him quickly. Now, even though we were out of time, we still had a long way to go back to the port. We might not have lines in the water but we are always looking for an opportunity. And one presented itself to us. I heard the guys yelling in the cockpit about a fish jumping slightly behind us. A free jumping Sail had appeared and jumped about 10 times heading right for the boat as we ran toward the port. Justin quickly launched a pitch bait and within seconds the fish was on it and hooked! Fighting the fish on a 20# spinner rod, we were on this fish right away, we had no other lines to clear. Russell was having a ball watching the fish jump and peel line off but one more jump and the fish threw the hook. While there was some disappointment in not an official catch, the fun had been had and our day ended as we rode home. Five different species made our day a happy one. The boys took some fish to eat and left me and Justin dinner. And I have to say, nothing beats fresh fish the evening it was caught. Thanks guys for a fun and enjoyable trip. Oh… They thanked us too. 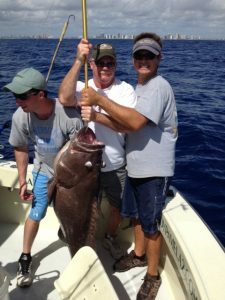 Something we do often, to entertain our guests while fishing here in Fort Lauderdale, is drop live baits on some of the deep wrecks and reefs here off our shore. Fort Lauderdale and Broward County have a fairly extensive artificial reef program. Old ships and other objects are placed on the bottom as fish havens. It takes less than a year for these structures to attract all kinds of fish. And this week, these deep spots have been producing some great fishing! Greater Amberjack are but one of the fish that take up residency around these wrecks and reefs. Their size can vary from low teens to over 40 lbs. And as with most bottom fish, they do not like being taken from their home. A live bait is dropped and the wait begins. Sometimes 10 or 15 minutes is needed but this week the bite has been fairly quick. The rod tip starts to quiver as the bait tries to escape whatever is looking at him, then the rod begins to bend. It happens quickly and soon the rod is doubled over, the boat is put in gear to pull the fish away from the wreck and it’s up to the angler to land his fish. Amberjacks fight hard all the way and depending on their size? It can be quite a battle even on the International 80 we used to pull these fish from the bottom. Cobia, large Snapper and Grouper also inhabit these areas and you’re never sure what will bite when you drop that bait. Today, after hitting a few spots, we came to a deep wreck and got quite the bite. With Alex in the chair, the rod doubled over and within seconds of the bite, the fish had wiggled his way back into the wreck. This is usually the point where you pull or break, and it’s usually break as wrecks are immovable. But when we let the line go slack, the fish made his mistake and swam from the wreck to get in a better hole, a few cranks of the reel, a pull with the boat and our fish was free and the fight began. It took over 20 minutes to bring this Warsaw Grouper to the surface. Alex had his hands full with this 80+lbs. Grouper. We never did weigh it but it’s one of the largest I’ve caught in some time. May is one of my favorite times of year to fish here in Fort Lauderdale. Almost everything we catch is migrating one way or the other and each day is different. We truly have no idea what we might encounter from day to day. Just coming off the full moon has slowed the Kingfish on the reef. These fish are very sensitive to the moon phase and on clear, full moon nights, have the ability to feed all night. The big ones have become scarce and the smaller ones are a bit finicky. But in the last few days, this has been improving as we distance ourselves from the big, bright moon. One thing about May is the Tunas that come around. Blackfins, nice sized ones too, have been fairly frequent. Trolling has been getting us some bites of fish up to about 20-25 lbs. Live bait has had Blackfins over 30 lbs. These big Tuna are very tough to catch, finesse is always needed as they have soft mouths and hooks come out easily. It takes some smooth reeling and working the rod to bring them to the gaff. 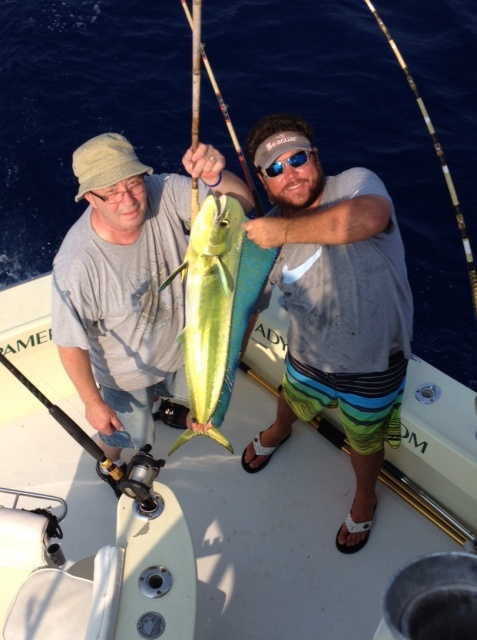 Dolphin fishing (Mahi-Mahi) has been erratic. The fish we’ve been catching have mostly been good size but the numbers are lower than expected. Lately found quite far from shore, it’s been a gamble to try for them but if they are found, it’s worth it! Fish over 30 and 40 lbs. are being caught and the smaller ones in the 8 to 12 lbs. range. Sailfish are everywhere from the reef area out to over 800 feet 6 to 8 miles from shore. Trolling has been the best method of catching since these fish are so spread out. Most live bait these days is used for pitch baits rather than kite fishing and trolling helps us cover some ground. And this time of year, you never know what may pop up as you drag those baits through the waters. A few Blue Marlin have popped up recently. Talk about exciting? Oh yeah! The fact is May is a great time to fish here in Fort Lauderdale. You can expect a return of the Bonitos on the reef area, Mahi’s a bit further off shore and there’s always the chance of a Sail or other kind of billfish. So grab the kids, a few friends or clients and let’s get out there. Spending a few hours on the water catching some fish isn’t a bad way to waste a bit of time. 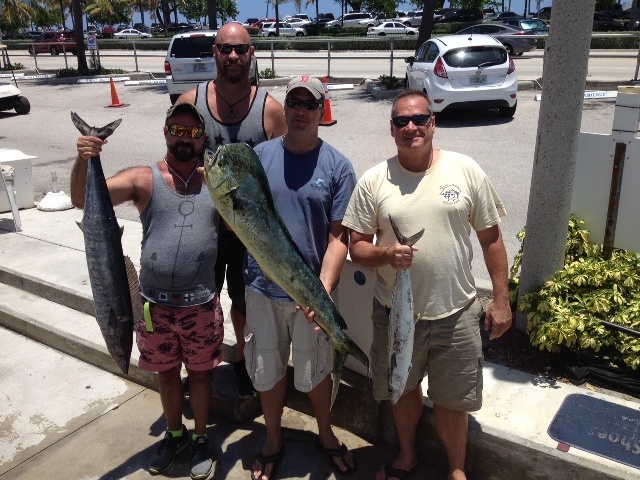 Some of our guests that fish with us in Fort Lauderdale just seem to be lucky and that certainly includes Rudy. Lucky at fishing is always good. He showed up with a new group of guys and was hoping for more of what we’d had the last trip. Some Mahi-Mahi, something big maybe too? With grey skies and a forecast of rain, the group showed up at the dock in a light drizzle. We loaded up and got some live bait on the way out. Live bait we buy works best in the kites and with light rain the kites don’t fly so we began trolling right out front. Normally, I like to venture away from the port on all day trips. But with a few friends out earlier than we were, I found fishing south and off shore was not producing. Meanwhile, back by our sea buoy, each pass and circle around the area was producing a bite. We caught a few Kingfish and then something big and strong on one of the deep lines. The planer was brought to the boat and then, very gingerly, Justin finger tipped whatever was on the line to the boat, over 100’ of shock cord. A frantic grab for the gaff once it was seen and this 20+lbs. Tuna was ours! Now that’s a nice fish! We worked the area for another hour or so and caught 2 more nice Tunas, another King, a nice sized Bonito and missed a few fish. A storm was around and we trolled a bit longer waiting for the skies to clear. Putting the kites up was really wanted now, live bait is excellent for catching large Mahi-Mahi! And finally, it stopped the rains and we did just that. Waiting patiently, we watched and hoped for something to continue our good day. At one point, the baits got very nervous and we saw a shadow appear. It turned out to be a big sea Turtle and even though Turtles don’t eat the baits, they didn’t seem to know that. Just a bit later, they again got very nervous and this is where the surprise came in. Sailfish haven’t been around much the last week or so but we had one on now. Rudy’s last trip his guest caught the Sail, this time was his turn and the fish gave him quite a battle. Sails usually jump but this fish was playing it down and dirty, staying deep in the water until he got next to the boat and Justin had the leader in his hand. It was at that point the guys got some great shots boat side of this fish jumping. I’m talking up close and personal stuff. I’m using one for this report and the others are in the gallery. We reset and a Hammerhead Shark came for our offerings but on the light tackle he made quick work of us and after 10 minutes, broke off and left us. The rain was coming once again and this time looked like it was here to stay so we headed in a bit early to clean Tuna for dinner that night, as well as some to take home. Thanks to Rudy, Mark, Bob, Chris and Randy. You guys were great. Some great photos too. And you have to love a surprise ending. Fishing in Fort Lauderdale is just one of the many attractions of things to do while visiting us. Many families come for the sun, the beaches and to generally relax and have some fun. Our family today has fished with us 5 times before and had very poor luck. Ken made this quite well known as he boarded the boat. It was also mentioned to me that neither Jodi nor Kate had ever caught a fish. We we’re just going to have to see what we can do about that! So a trolling we went and the Kingfish were biting. Ken and John brought the first few in and I then found out why Jodi had never caught a fish. She stays on the flybridge with the captain. She doesn’t like boats and feels comfortable there. So I had to wait till the bathroom called her down on deck to get her the first fish of her life! I have to tell you, this is one of the best parts of my life as captain too. It might be just a Kingfish, but this was her first Kingfish, first fish. And that is truly something special. We ended up catching and keeping 6 Kings and a Bonito, tossing back a couple of small Kings and missing a few. The bite was slowing and Ken wanted to try for something big so we went deep and deployed a slightly better buffet offering to the fish gods. A few shark baits and a few livies from the kite was all we needed. With the action slowed, we waited for our first visitor which was a huge Hammerhead Shark! He came for the bait in the kite and both Justin and I were in awe of his size. He took the bait, ran with it and when we went to set the hook? The line snapped at the reel with a loud shot like sound. Talk about disappointment, we were crushed. This happens so seldom, we are tenacious about our fishing gear. As the cruelty of a loss like this settled the bottom rod went off and we were once again connected to something big! Ken was in the chair first and fought the fish for a while. Then John settled in and after about 30 minutes, we got a look at another Hammerhead Shark that had taken the bait. About 8’ in length and 200+ pounds, this fish wasn’t happy with the boat and ran the line out all the way to the bottom. With Ken back in the chair the fish was again brought to the boat and pictures taken before releasing her back to the sea. Both the fish and anglers were exhausted. 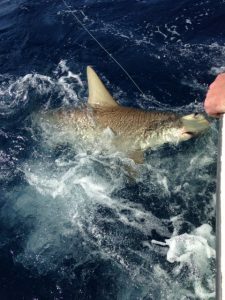 Nice picture of this shark by the back of the boat, compliments of Ken. With time running short we tried for a few Tuna but struck out and headed home with our bounty. The restaurant next door would provide dinner, which delighted Jodi as to not having to cook. 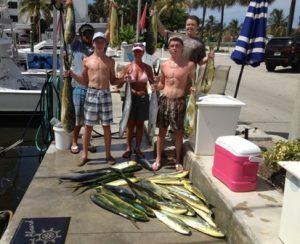 This family had fun fishing in Fort Lauderdale and as some groups do, they became more than guests, they became friends. Both Jodi and Katie caught their first fish, a sea monster was released and the story will live on. I have to say, I had a ball on this trip as well. Thanks to all.